"Covering the New Orleans Art World and World Art in New Orleans." DT = Russian Mafia or DT = Postmodernism? Can Art Save a City? Black Fireworks by Cai Guo-Qiang, the Prospect.1 artist responsible for the fireworks at the Beijing Olympics, illuminates the auditorium at the Colton School on St. Claude Avenue. Can art save a city?" So began a glowing article on the Prospect.1 biennial in the National Trust for Historic Preservation's magazine, Preservation. Even if it sounds far-fetched, it may not really be much of a stretch. Prospect.1 is the most obvious example, but it's not the only ambitious art effort designed to reclaim New Orleans' greatness. Although our art scene has long been bigger and more vibrant than those of many other cities, we were often insulated from both the global cultural elite and the backstreet communities of the inner city. That began to change in 2008, as the art world's leaders visited en masse and artists increasingly focused attention on our most neglected neighborhoods. "It's almost like being in some other city," says gallery owner Arthur Roger. "There's a fresh, new energy here now." Jonathan Ferrara, of the gallery that bears his name, agrees. "I was at Prospect.1's booth at the Art Basel art fair, and the people who were coming up and discussing their experiences here were some of the top names in the international art world. It was amazing." Of course, the Wall Street crash that preceded Prospect.1's opening undoubtedly hampered attendance and cash flow, yet it and other projects designed with socio-economic benefits in mind, have still been game changers as reflected in glowing stories in The New York Times, The New Yorker, London's The Guardian, Art Daily, Artforum and on NPR's All Things Considered, among others. Prospect.1 is the most visible part of a movement of America's brightest and most creative citizens to come to the city to help "make it right," as Brad Pitt so aptly put it. Inspired community art efforts include the St. Claude Collective's art and healing center at 2372 St. Claude Ave., the Creative Alliance of New Orleans' Colton School project at 2300 St. Claude Ave., a Prospect.1 site that also provides free studio and exhibition space to more than 100 artists who agreed to create collaborative works with New Orleans high school students. The project Sculpture for New Orleans treats the city as one big exhibition space and has so far installed 21 major world-class sculptures to enhance its position as a global art capital. AORTA Projects uses grassroots art installations to enliven the post-disaster landscape so "crisis becomes an opportunity for positive growth" — a goal shared by Transforma Projects, which has the motto: "Every community needs the creative power of its people." What these and related groups share is a sense of New Orleans as an artwork unto itself, where the creative community is actively engaged in what Seventh Ward art activist Willie Birch calls "the practice of being here." 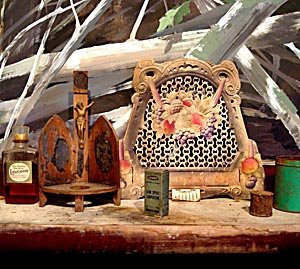 Adam Cvijanovic's swamp murals at the Tekrema Center share space with the assorted relics of the antique structure's former inhabitants. Not long after Prospect.1 opened, the Houston Chronicle's art writer, Douglas Britt, ran some photos in his "Arts in Houston" blog with the comment: "There was some terrific art at the conventional sites, but what really made this biennial special was the site-specific installations in the Lower 9th Ward." Others have said as much for the city overall, but the Lower Ninth really is special — not because of the destruction, but for the sense you get on a quiet, sunny day in Holy Cross that this may be the most soulful neighborhood in America. Traces of things hauntingly poetic coexist with the damage and decay, but the biennial is the main attraction, and trying to find all the sites by car can pose some navigational challenges. What follows are a few tips for finding your way around, as well as some commentary on the installations themselves. The first step is to get to the L9 Center for the Arts (539 Caffin Ave.). On one side is Anne Deleporte's ethereal Editorial Blue collage mural, and the other side features Keith Calhoun and Chandra McCormick's eloquent photographs of local street life culled from what they could salvage of their three decades worth of work after the storm. On a nearby table are Prospect.1's free and very helpful maps of its site-specific installations in the area, and this map is really the only way to find them by car because the larger official map lacks the necessary street information. Catercorner from the L9 Center is Wangechi Mutu's Miss Sarah's House, a skeletal frame where Sarah Lastie's house once stood. Luminous at twilight, it's essentially a visualization that will hopefully lead to its restoration. 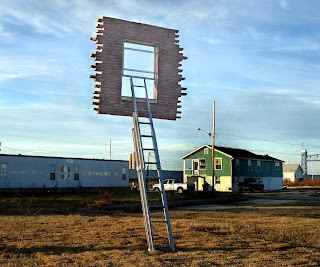 The next stop is the nearby Tekrema Center (5640 Burgundy St.), a one-time hardware store that now houses a mysterious installation by Chilean artist Sebastián Preece. Like an odd archeological dig, it features concrete slabs turned upside down, or replaced with other concrete slabs to reveal secret topologies or obscure geopsychic excavations. 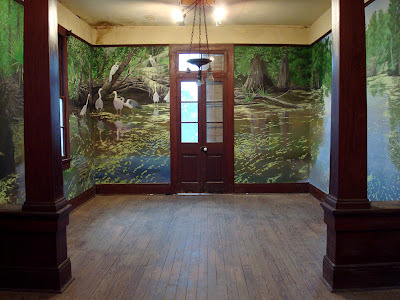 Upstairs, the walls are covered in Louisiana swamp murals by New York painter Adam Cvijanovic, which are upstaged by the house itself, a time warp filled with the spirits of its former inhabitants and their assorted relics, some of which remain on a mantle in the form of old turpentine and mouthwash bottles, a battered crucifix and a calendar from February 1924. More problematic is a house (5418 Dauphine St.) transformed by the talented German artist Katharina Grosse into a fiery expressionist painting. Such tactics work well in soulless urban environments but can seem tone deaf in this most soulful of neighborhoods. While Mark Bradford's house-size ark (2201 Caffin Ave.) is well known, Miguel Palma's Rescue Games piece at the Lower Ninth Ward Village (1001 Charbonnet St.) is no less monumental. A life-size recreation of a World War II Higgins landing craft, it holds a shallow sea of water that becomes a tidal surge when the craft lurches to and fro on hydraulic pistons as the eerie soundtrack from Janine Antoni's video of horrified eyes and wrecking balls emanates from the next room. The flood ravaged Battleground Baptist Church (2200 Flood St.) holds Nari Ward's Diamond Gym sculpture. A skeletal diamond-shaped steel cage filled with gym equipment surrounded by mirrors, it makes an inexplicably powerful statement to the accompaniment of famous Civil Rights-era sermons. Robin Rhode's simple fountain in the shell of a former playground structure (2500 Caffin Ave.) is meditative when the water's turned on, but almost disappears when it's not. Finally, Argentine artist Leandro Ehrlich's great Window and Ladder sculpture (1800 Deslonde St.) serendipitously takes us to the new Brad Pitt houses and the old Common Ground compound, where Egyptian artist Ghada Amer's spindly Happily Ever After metal sculpture suggests the fragility of such glad tidings. With regard to the Lower Ninth Ward, we can only hope it's a prophecy. In Kyle Cassidy's ironic Chris and Cecelia, handguns appear as tattoos and a small pistol almost blends in amid the clutter of the kitchen. We find ourselves in momentous times. Big things are happening not only globally, but in New Orleans' art community. Fortunately, most of our momentous local art events are of the positive sort, with the successful inaugural Fringe Festival last month, the very large Prospect.1 international biennial continuing through mid-January, and now the New Orleans Photo Alliance's third annual PhotoNOLA expo through December. With work at more than eight museums and three dozen galleries and alternative spaces, it is clearly too big for a single review, so I'll indulge in a bit of trend spotting amid the sheer mass of offerings. One genre that really stands out this year is street photography, not so much in the traditional sense of 20th century street photographers like Robert Frank or Lee Friedlander, but as a rebirth of the practice of documenting communities and subcultures. What had been a primary focus of WPA-era photographers such as Dorothea Lange and Russell Lee is back on the front burner again, as we see in several new expos and especially two different yet topically related shows at the McKenna Museum of African-American Art and the Photo Alliance Gallery. Shootout: Lonely Crusade ... An Homage to Jamel Shabazz at the McKenna Museum features 25 emerging photographers inspired by the street portraiture of Brooklyn photographer Shabazz from the early days of hip-hop, first in magazines and later in books like A Time Before Crack. Shabazz was a master of extemporaneous eloquence, but in this show, because each photographer is represented by only one or two images, it's hard to get any real sense of their individual vision, causing many to come across as glorified snapshots. Even so, it's a gritty, gutsy show that works as an installation. It also is an interesting counterpoint to the Prospect.1 exhibition (upstairs) of more formally posed portraits by prominent photographer Malick Sidibé of Mali produced during the African nation's transitional years in the '60s and '70s. At 527 Gallery on Julia Street, Tina Freeman's obliquely related color photographs of elaborate graffiti in a vast, abandoned industrial building evoke an Anselm Kiefer take on a street-punk dystopia. And Lori Waselchuk's Love and Concrete show at the Photo Alliance Gallery explores life along North Claiborne Avenue from Tremé to the Ninth Ward in a series of finely produced black-and-white prints. A Louisiana artist formerly based in South Africa, Waselchuk eloquently documents local backstreets that have much in common with those in Shootout, but with the benefit of brass bands. Around the corner, the Darkroom's GUNS 'n US expo of work by Kyle Cassidy, Donna De Cesare, Frank Relle and Andre Lambertson provides a powerfully poetic look at American gun culture, from those who equate guns with family values to others who don't like violence but pack heat anyway. Relle also has a solo show, Inside Eleven Homes, at the GSL Gallery. It explores how people, especially New Orleanians, accumulate things for sentimental reasons and transform them into talismanic, rather than functional, objects. Lacking the drama of his previous projects, this one is pointedly prosaic and psychological in effect. More community and subculture documentation appears in the work of Kevin Kline and Eddie Lanieri at Home Space on St. Roch Avenue. Kline's street portraits of ordinary Orleanians appear less ordinary when mounted in old bottles, which lend them the buoyant aura of votive candles, or messages in bottles. And Lanieri takes a walk on the wild side with portraits of drag queens in various stages of dress, part of her series exploring gender and identity. Part art, part sociology, these shows reflect a burgeoning interest in the meaning of community, even as they represent only a portion of this year's extensive PhotoNOLA offerings. One of the many interesting discussions generated by the Prospect.1 biennial has to do with favorites. Almost everyone has not only a favorite artist or exhibit, but also a favorite venue. Of the two main exhibition halls occupied entirely by Prospect.1 artworks, the Contemporary Arts Center seems to be a favorite of artists with masters degrees, while the Old U.S. Mint appears to be a favorite of art buffs less steeped in trends and academia. Why that would be is anyone's guess, but one factor may be accessibility: the work at the Mint tends to be accessible in ways that are often sensual and occasionally humorous. The CAC stuff tends toward a grittier sort of Sturm und drang mingled with more cerebral conceptual musings. Both are meaty and provocative, but the work at the Mint may be more seductive, as evidenced in Blossom, by upstate New York-based artist Sanford Biggers. An actual player piano entangled in a tree — the sort of juxtaposition Hurricane Katrina so often left in its wake — plays a familiar melody as if by a ghostly pianist. The melody is "Strange Fruit," a harmonically seductive song popularized by Billie Holiday, but the "strange fruit" in the lyrics actually refers to the bodies of lynched black men hanging from trees after authorities turned a blind eye — a stance some saw as analogous to the Bush administration's neglect of the city, especially the Lower Ninth Ward, in the wake of the storm. As if to drive home the point, Zwelethu Mthetwa's Common Ground Series of photographs of impoverished shantytowns in his native South Africa are shown with photos of flood-ravaged Lower Ninth Ward homes, and it's often difficult to tell them apart. Bold, colorful and gorgeously composed, they seduce the viewer into other worlds where many might not otherwise venture. Similarly, New Orleanian Deborah Luster uses archaic photo techniques to elegantly hypnotic effect in photographs of violent-crime sites in Orleans Parish. Nigerian artist El Anutsui's large, metallic wall hangings are lushly sensual in their melding of African and Western abstraction, but look again and his materials turn out to be caps and foil from discarded liquor bottles woven with copper wire in a triumph of recycling, a literal transformation of trash into treasure. In like manner, Brazilian artist Beatriz Milhazes mines discarded styles from the past in the form of brightly colored op and pop icons from the '60s and '70s — plastic flowers, targets, Christmas and Carnival ornaments — transformed into a large and extraordinary mobile. French New Yorker Anne Deleporte quite literally transformed yesterday's newspapers by pasting them on the Mint's walls and vaulted ceiling, and then painted everything sky blue except for key iconic images such as dancers, airplanes, dollars and snakes, all floating in space like the afterimages or apparitions of collective memory. Similarly, New Yorker Fred Tomaselli collages printed images of tiny eyes, lips and body parts along with colorful acrylic dots in paintings that meld the look of Mardi Gras beads, psychedelic patterning and DNA spirals in a tribute to regeneration in the wake of chaos. If all this sounds a little lush, Los Angeles artist Stephen Rhodes takes us on a wild ride that seems almost inspired by John Belushi and the Marx Brothers. Like a parody of the Hall of Presidents at Disneyland, it's really his protest against the degradation of American ideals by various office holders, past and present. Japan's Yasumasa Morimura, a kind of transsexual Cindy Sherman, mocks the pretenses of art and politics in his hilariously madcap photo self-portraits. Local Serbo-Croatian artist Srdjan Loncar rounds it out with his acerbic Value installation, employing stacks of fake cash to comment on the way art and finance speculators have turned the world into a manic-depressive casino. Be that as it may, the Mint has never looked so good. Finding "quantum strangeness at its deepest level"